Watching regular TV is such a thing of the past. We’ve all become more protective of our free time! Here’s what’s bring added to your fave streaming sources. (CNN) — Netflix, Amazon and Hulu are adding titles to their streaming options in September. It’s been a whirlwind of a summer. The chart above may be reflective of the stats, but it certainly doesn’t reflect all the activity. Here’s a breakdown of what we’re seeing in Clay and Platte Counties as well as the entire Kansas City Regional area. 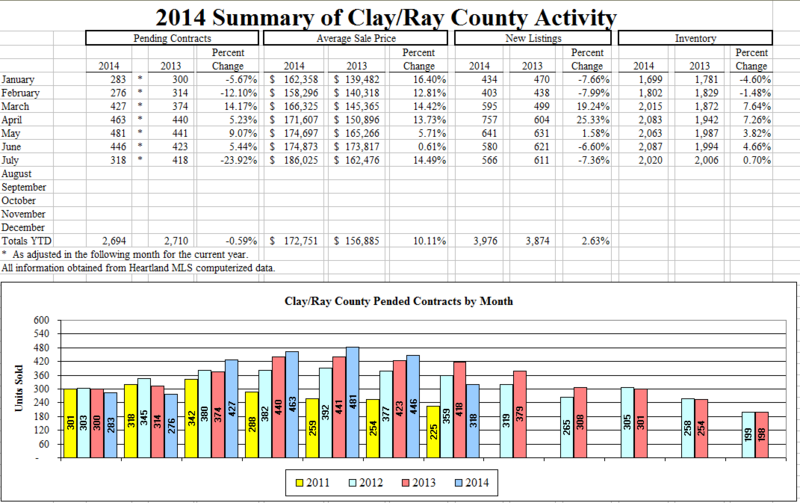 Clay/Ray County sales were down for the month by 23.9% from 2013. Units were at 318 versus 418 last year. Year to date, unit sales are down 0.6%, with 2,694 units this year versus 2,710 last year. The average sales price for the month was up 14.5% from last year, with an average price of $186,025. Year to date, the average price is up 10.1%. The average price is $172,751 versus $156,885 last year. New listings were down 45 units to 566 or 7.4% from last year’s 611 units. Inventory is up 0.7% from last year and is running at 2,020 units. Inventory is down 67 units from last month. Platte County sales were down for the month by 13.7% from 2013. Units were at 151 versus 175 last year. Year to date, unit sales are up 0.9%, with 1,181 units this year versus 1,171 last year. The average sales price for the month was up 15.5% over last year, with an average price of $241,119. Year to date, the average price is up 8.7% from last year. The average price is $221,599 versus $201,989 last year. New listings in Platte County were up 8 units to 264, up 3.1% from last year’s 256 units. Inventory increased 6.6% from last year and is running at 938 units. Inventory is down 7 units from last month. Adjusted sales* for the entire Heartland area were at 2,801, down 9.4% or 291 units. The average price was up 4.4%, and averaging $205,109. Year to date, sales were down 1.0% or 210 units for a total of 20,557 for 2014. The average price for the year is running at $190,667, up 5.8% from 2013’s average of $180,252. This is all important, but what you’re not seeing is the reason so many agents feel overwhelmed right now. The past 4 or 5 weeks have been full of frustration for buyers and sellers. There’s been many contracts that have fallen through because of financing, inspections or appraisals. Problems like this create a sort of log jam in the system since most buyers will move onto another property after not getting their first choice. Most sellers will make repairs and drop prices and try to attract the eyes of a new buyer. All of this boils down to real estate agents doing more and more work. While one could argue (and some will) it’s what we get paid to do, the other side will argue that we actually don’t get paid until the property closes. So, for some clients, an agent will work three times as hard and much longer hours for the same amount of pay. While the end goal is always customer satisfaction, I hope this sheds some light on how frustrating the business can be at times. A great real estate agent will take the brunt of the frustrations and issues and try to keep the transaction flowing smoothly for all parties. We’re here, we’re working, we may just be quieter than usual and the stats may look like we aren’t. Trust me, it couldn’t be further from the truth.